A limitless expanse of water lilies covers the walls of a room at the Orangerie in Paris producing a sense of awe at the culmination of Monet’s years of tedious focus upon his pond and the water lilies at Giverny: the Grandes Decorations (1921). Many people assume that Monet's love of observing nature and efforts to capture the different effects of light on a setting, particularly the water in this case, inspired the enormous panels that create such an impressive effect. In fact, C.P. 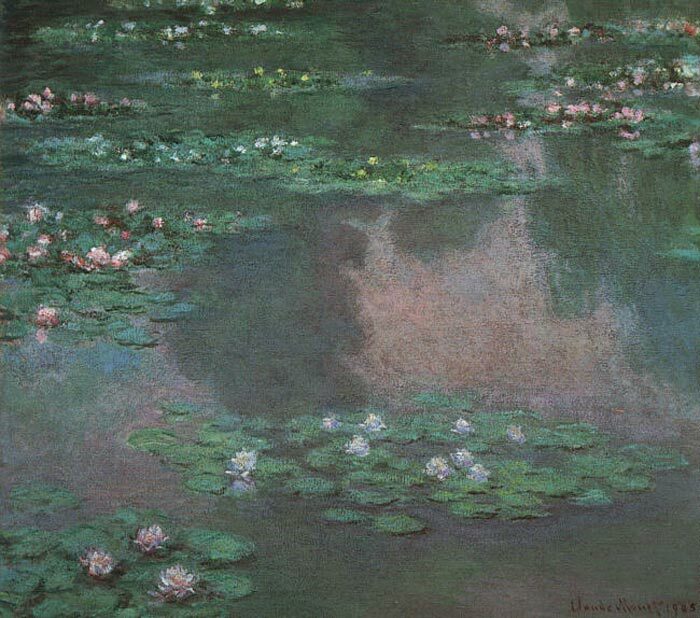 Weekes, author of The Invincible Monet stated, “Even Monet paintings, which to modern eyes appear the essence of romance, were to him scientifically exact Oil Paintings of the effect of light on nature at any given moment” (Weekes 226). SPECIAL NOTE : The painter will make the reproduction as close to the original oil painting as possible. If you want your painting to alter from this likeness, please email us and " Water Lillies I " will be reproduced according to your special requirements.